Moving on to the specs, the tablet will have a 10.1 IPS capacitive multi-touch display with a resolution of 1280 x 800 pixels and will draw power from a A31 (ARM Cortex A7) Quad-Core processor clocked at 1.0GHz with PowerVR SGX544MP2 GPU, combined with 2GB of RAM and 16GB of internal memory. On top of that, the Firefox tablets will have two cameras on board (5MP on the back and 2MP in front), microSD, microUSB, 802.11 b/g/n Wi-Fi, Bluetooth, Gyroscope, and GPS. Also worthy of attention is the fact the slate will come with a pretty capable 7000 mAh battery. An LTE version is not mentioned as being in the cards, but it might become a reality at some point. 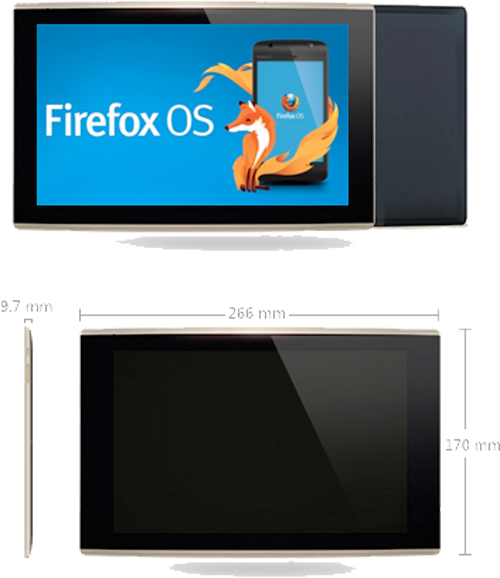 The dimensions of Firefox tablets are 266 x 170 x 9.7 mm / 10.4 x 6.6 x 0.38 inches.